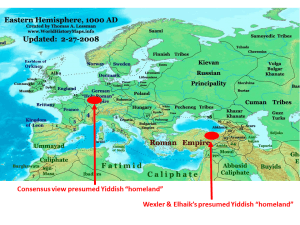 Home » "Bad Linguistics" » Is Yiddish to Be Traced to Turkey? In the past few days, several popular media outlets, including Daily Mail, Popular Archaeology, and Times of Israel, posted articles about recently published research by Paul Wexler, Eran Elhaik, and their colleagues about the origins of Yiddish and Ashkenazi Jews (Das et al., 2016, published in Genome Biology and Evolution). As my long-time readers would know, I have been working on this topic for some time now—and will be presenting my results at the International Conference on “Language Contact, Continuity and Change in the Emergence of Modern Hebrew” in Jerusalem this summer. So naturally, these reports have immediately caught my attention. The two senior members of the team have worked on related topics for some time: linguist Paul Wexler has published extensively on the history of Yiddish (and Hebrew), and geneticists Eran Elhaik has previously published work in support of the Khazarian Hypothesis of Ashkenazi Jewish origins. I have commented on their works in earlier posts on this blog (see here and the series of posts starting here). I am currently working on a detailed response to the research article by Das et al., but since many of my readers are likely to read only the reports in the popular media, I would like to comment to these reports here. Words for ‘boy’, ‘girl’, and ‘see’ are not cognates and not even look-alikes. The word order is different: in Turkish, the verb comes at the end of the sentence, while in Yiddish it is in the middle. And the Yiddish sentence has more words than the Turkish counterpart: both ‘boy’ and ‘girl’ come “adorned” with definite articles, dos and di, respectively, and the futurity is expressed by an auxiliary vet rather than by inflection on the verb itself. Grammatical differences between Yiddish and Turkish go further still. For example, in Yiddish definiteness is expressed by articles (dos and di for definites vs. a for indefinites), while in Turkish definiteness is expressed on nouns themselves, and only for the object in the form of the suffix –ı (here, on kız-ı). To say ‘The girl will see the boy’ in Yiddish all we have to do is to flip the order of the subject and the object: Di meydl vet zen dos yingl (in Yiddish, subjects and objects are also marked for nominative and accusative case, respectively, but often the nominative and accusative forms are the same, as is the case here). In contrast, in Turkish we have to “move” the accusative case suffixe from kız ‘girl’ to oğlan ‘boy’: Kız oğlan-ı görecek. Note that although both ‘boy’ and ‘girl’ are definite, only the one that finds itself in the object position has an explicit expression of definiteness in Turkish. Moreover, Turkish exhibits the so-called vowel harmony: all vowels in a word must be the same in the front/back dimension (i.e. how far forward the tongue is positioned to pronounce the vowel) and roundedness (i.e. the shape of the lips). For example, the past tense suffix can be pronounced in at least four different ways: -di in gel-di ‘(he) came’, -dı in anla-dı ‘(he) understood’, -dü in gör-dü ‘(he) saw’, and ‑du in bul-du ‘(he) found’ (additional forms due to consonant assimilation are not considered here). 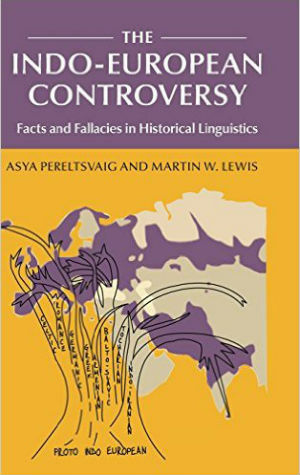 Most Turkic languages exhibit vowel harmony (with the exception of Uzbek, which presumably lost vowel harmony through contact with non-Turkic languages); Yiddish, in contrast, does not, and there is no evidence that it ever had. However, “Turkish dialect” is not the only error in the Daily Mail headline. It also states that Yiddish was “invented”. Some languages, including some well-known ones like Esperanto and Klingon, have indeed been invented or constructed (hence the term ConLangs, “constructed languages”), but there is no evidence whatsoever that Yiddish was invented in a similar fashion, rather than developed naturally. The headline in Popular Archaeology, “DNA sat nav uncovers ancient Ashkenaz and Yiddish origin”, is problematic too as it appears to have been created by someone who gave the article itself only a cursory reading. The article does make reference to “GPS”, which must be what the headline writer meant by “sat nav”, but the researchers used a very different tool, one that has little to do with satellites or navigation, but just happens to abbreviate the same way as the “sat nav” tool a layperson would be familiar with. The GPS used by Das et al. (2016: 6) is the Geographic Population Structure, described in the article as a software that “infers the geographical coordinates of an individual by matching its admixture proportions with those of reference populations known to reside in a certain geographical region for a substantial period of time”. As far as I can gather, it does the job without help from outer space. The Times of Israel headline, “New DNA tech traces origins of Yiddish to… Turkey”, is much more appropriate to the article itself, which nonetheless contains a few problematic statements attributed to the lead researcher, Erah Elhaik. First, much like in the Popular Archaeology headline, Elhaik uses the word “invented” in describing the origins of Yiddish (though neither in the press release nor in the research article does he offer any evidence for the ConLang nature of Yiddish). He also refers to Yiddish as “a secret language that very few [could] speak or understand other than Jews”. “Secret languages” are not uncommon, ranging from English children’s Pig Latin and French teenagers’ Verlan to Cockney rhyming slang and to the nut-gathering (“pandanus”) form of Kewa, a language used by the Kewa people in Papua New Guinea… you guessed it, during the annual gathering of pandanus nuts! Still, attributing the emergence of Yiddish to secrecy is odd in the context of numerous other mixed Jewish languages, including Ladino, Judeo-Arabic, Judeo-Persian, Judeo-Tat, Judeo-Malayalam, Karaim, Krymchak, and others. Everywhere the Jews settled, it seems, they went on to adopt (modified versions of) the languages of the locals so that they could interact with their non-Jewish neighbors. The only language that Jews around the world used as marker of Jewish identity is Hebrew, which served as both the language of prayer and on occasion a lingua franca for Jews from far-flung communities that used different local languages. The Times of Israel article goes on to cite Elhaik as saying that “Yiddish is truly a combination of familiar and adapted German words using Slavic grammar”. 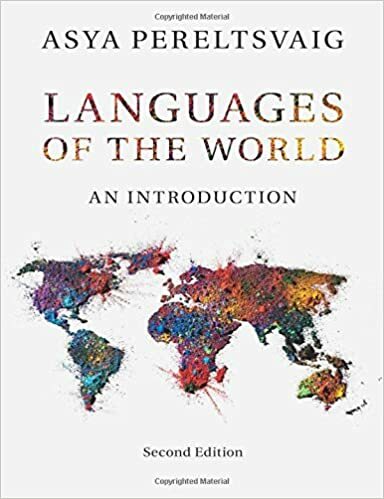 We will leave aside the issue of words, which, as discussed in my earlier posts, are easily and frequently borrowed from one language to another, and are therefore not the best way to establish language relatedness. What of the Yiddish grammar? Contrary to Elhaik’s claim, which is probably based on his collaborator Paul Wexler’s earlier work, the grammar of Yiddish does not strike a speaker or scholar of Slavic as particularly familiar. As mentioned above, Yiddish uses both definite and indefinite articles, which are notoriously absent from Slavic languages (with the exception of Bulgarian and Macedonian, which have an article-like element, probably “borrowed” from other Balkan languages). On the other hand, Yiddish is lacking the rich case system that characterizes most Slavic languages (again, with the exception of Bulgarian and Macedonian, whose case systems are much reduced, also due to their “Balkanization”). The word order in Yiddish is also different from what is found in most Slavic languages, which are known for their “flexible” word order, driven by such factors as information structure (what is given and what is new, in the context of the utterance). In contrast, Yiddish exhibits the Verb-Second pattern, which is characteristic of Germanic rather than Slavic languages. However, Slavic languages had a significant impact on Eastern Yiddish, which was co-territorial mostly with Slavic languages (as well as Lithuanian), in contrast to Western Yiddish, which was spoken in Germanic-speaking lands. 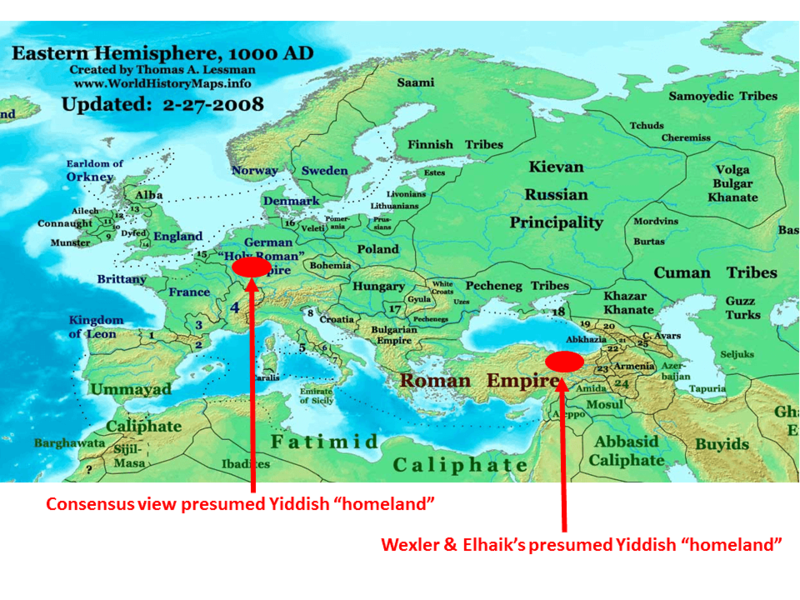 These two varieties of Yiddish emerged in the 15th-17th centuries, and Western Yiddish has subsequently virtually died out, so most Yiddish speakers one is likely to encounter today speak Eastern Yiddish. Slavic influences on the phonology, morphology, and lexicon of Eastern Yiddish are especially well-documented (e.g. Weinreich 1980, inter alia). My own research shows how changes in the syntax of Yiddish, which are documented in texts from the East but not from the West starting in the late 1500s, can be attributed to the influence of co-territorial Slavic languages. Yet, those are later influences found in only one variety of Yiddish; therefore, the origins of Yiddish are not with Slavic languages. The quote ascribed to the team’s other lead researcher, Paul Wexler, in the Daily Mail article is also bizarre: “The linguistic data used are from Yiddish, which we assume was invented in Western Asia as a Slavic language with a largely German-like lexicon and a significant Iranian component on all levels of the language.” First, if the researchers assume that Yiddish comes from Western Asia, the results of their research cannot possibly be that Yiddish comes from Western Asia, as the abstract of Das et al. suggests. This would simply be circular reasoning. Moreover, if one were to come up with a new language in northern Turkey, as the researchers claim, it is not impossible for it to have some Iranian influences (Kurdish dialects/languages are spoken nearby), but why would it have Slavic grammar and German(ic) lexicon?! The plot thickens if we try to find answers by putting together these reports in the popular media. The Times of Israel piece states that “the researchers have surmised that [Yiddish] may have been invented by Iranian and Slavic Jews who traded on the Silk Road around the 9th century”. But historical geography is further muddled in the Daily Mail piece, which states that “researchers … believe that towards the end of the first millennium, Ashkenazic Jews may have relocated to Khazaria before moving into Europe half a millennium later after the fall of the Khazarian Empire”. Putting together all three reports, Ashkenazi Jews must have moved in the 9th or 10th century from the then-mostly-Greek-speaking northern Anatolia where they had “invented” a language with “Iranian, Turkish, and Slavic origins” (as stated in all three reports under consideration here) to Khazaria, mostly Turkic-speaking but with a significant Slavic population in its western fringe, and then 500 years later—in the mid-1300s to late 1400s—moved from Khazaria, which had collapsed some 250-400 years earlier, to Europe. 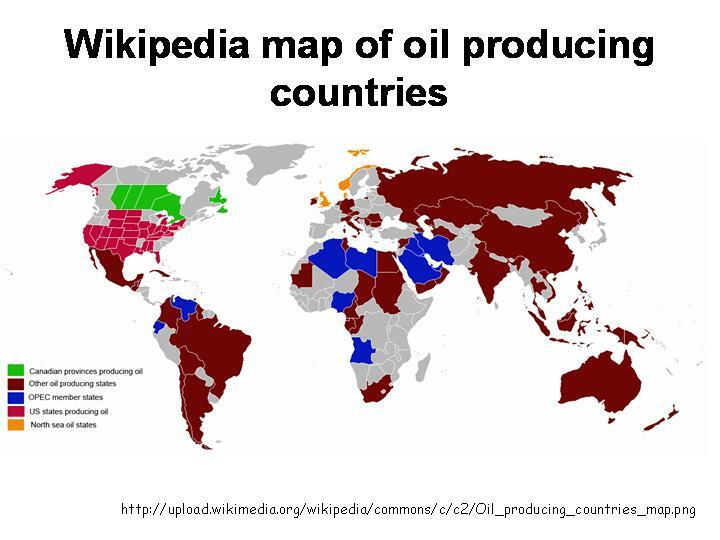 None of this, however, make any sense! Moreover, presumably, Yiddish-speaking Ashkenazi Jews must have moved at least as far west as the Germanic-speaking lands, where they could introduce both “common and unfamiliar German words” (as in mentioned in the Daily Mail article) to their language. But this scenario, cobbled from the popular media reports, is not only a higgledy-piggledy jumble of peoples, places, and times, but it also contradicts the fact, noted in Weinreich (1980) and cited in Santorini (1989: 18), that “Yiddish-speaking Jewish communities had been established along the Main, the upper Danube and the upper Rhine and as far south as northern Italy” already “by the middle of the 1200’s”. There are written documents to support the claim that Jews in Germany used an early form of Yiddish long before the date when Wexler and Elhaik claim they got there. Moreover, by the mid-1300s and subsequently, the movement of Ashkenazi Jews across Europe was not westward but eastward as they were escaping persecutions in the wake of the Black Death. Before trying to make sense of all this gobbledygook by considering (in a subsequent post) the scholarly article written by the researchers themselves, I will briefly mention one other nonsensical and therefore amusing quote from the Daily Mail piece: Yiddish purportedly “has an unmusical grammatical structure of its own”. What is that even supposed to mean? As opposed to a musical grammatical structure of what language or languages? In what sense can grammar be musical or not? When I read reports such as these, I wonder if journalists think their readers to be completely ignorant nincompoops. But perhaps a simpler explanation is that the reporters themselves are.